^ War Department, U.S. Army Air Forces Report of Aircraft Accident #43-2-17-11. ^ Baugher, Joe. 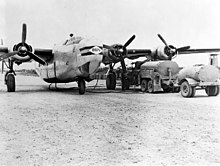 "Consolidated B-24." Joe Baugher's Encyclopedia of American Military Aircraft, 13 June 2004. Retrieved: 25 April 2006. ^ a b Dorr 2002, p. l34. ^ a b c d e f g Andrade 1987, pp. 42, 82, 87. ^ "Liberator." bharat-rakshak.com. Retrieved: 9 December 2010.